Plagiarism – it’s an ugly word. It means that you don’t have an original idea so you blatantly copy one from somebody else. 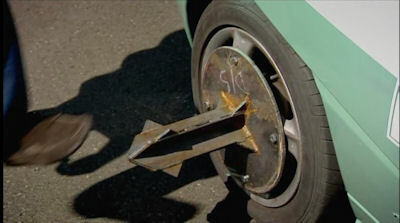 It is, unfortunately, a situation that has occurred on Top Gear. 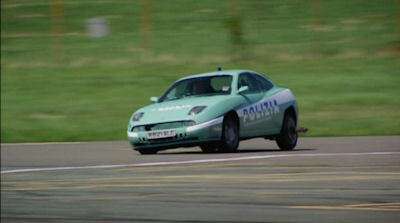 Season 11, Episode 1 has a typical Clarksonian stunt involving the cast building their own police cars (at a cost of no more than 900 pounds) and equipping them (500 pounds). So little budget doesn’t yield much in the way of valuable police equipment… and of course the guys aren’t trained in legitimate police tactics. So of course improvisation is the order of the day. That’s where Clarkson makes his mistake… simply stealing from the most famous movie scenes ever filmed: William Wyler’s fabulous chariot race in the 1959 Ben Hur. You may remember that the character Messala (Stephen Boyd) hated Ben Hur (Charlton Heston). In a chariot race, Messala ups the stakes (no pun intended) by mounting sharpened spikes on the axle of his chariot. Cutting the wheels apart.. with catastrophic results. And then he gets what he deserves himself. At this point I’ll stop the description of that because what eventually happened to Messala is too terrible to show in a family blog like this. Getting back to Top Gear… after 10 seasons of mayhem, ideas have apparently run out. Introducing what Clarkson calls the “Bodecea Spike“. Check your history books for references to Bodecea – she was one of the most famous and heroic Brits ever. But we happen to know that such a spike was in use even earlier in time, in the much earlier days of the Roman Empire. we saw it used in Ben Hur! Ready to bring the Stig to an abrupt halt…? 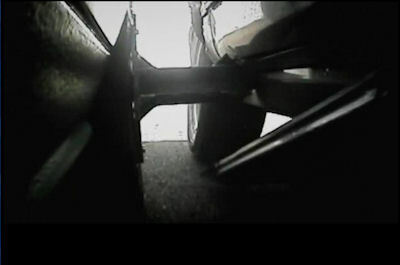 Rammed into the side of the Stigs car. Now you should lookup and watch the original Ben Hur chariot race with Charlton Heston (caution: bloody ending!). The production standards here, are, ahem, entirely different than those of Top Gear!